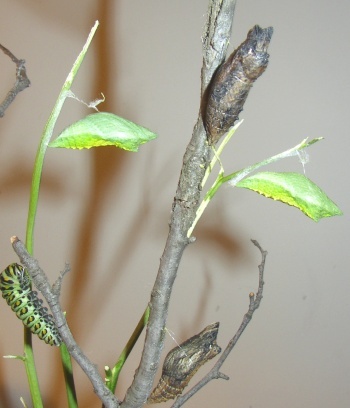 Black Swallowtail Chrysalis Unable to move! My kids and I have had the extraordinary and quite-by-chance opportunity to experience a Black Swallowtail caterpillar eat and grow and enter the chrysalis stage right on our kitchen windowsill. He crawled off of the parsley plant and right up the wooden frame of the window above the sink. In looking for an approximate length of time before the butterfly emerges, I just this moment read that since it is fall, the chrysalis goes into a type of hibernation until late spring. I am not able to relocate it into the garage without tearing the silk from the window frame. We keep our house 68 - 70 degrees, similar to late spring perhaps, but obviously cannot simulate the amount of daylight hours of spring. What do you suggest is the best way to care for our special house guest?? Thank you! I am so happy your family got to experience the amazing transformation of the black swallowtail caterpillar! Although I have reattached a Monarch chrysalis before, I have not done so with a Black Swallowtail chrysalis. I would think the goal would be similar, though. Cut the silk thread on both ends of the chrysalis so you have as much thread as possible still attached to the chrysalis and very gently handle the chrysalis. Tie some sewing thread to the longer silk thread and attach it to a branch or something so that the chrysalis is "hanging", then put it out in your garage. When it warms up in the spring, bring it inside so you can witness the miracle of it emerging! I hope this helps....let me know how it goes (you can leave a comment below). I have often moved the swallowtail chrysalises and put them in homemade hatching cages (cardboard and net material). I just lay them on the bottom and when they come out, they hang on the net sides and do just fine. They can be released easily that way.